This article is about analog component video. For the processing of color components in digital video, see Digital video, Chroma subsampling, and YCbCr. Not to be confused with Composite video. 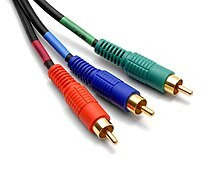 Three cables, each with RCA plugs at both ends, are often used to carry YPbPr analog component video. Component video is a video signal that has been split into two or more component channels. In popular use, it refers to a type of component analog video (CAV) information that is transmitted or stored as three separate signals. Component video can be contrasted with composite video (NTSC, PAL or SECAM) in which all the video information is combined into a single line level signal that is used in analog television. Like composite, component-video cables do not carry audio and are often paired with audio cables. When used without any other qualifications the term component video usually refers to analog YPBPR component video with sync on luma. Reproducing a video signal on a display device (for example, a cathode ray tube (CRT)) is a straightforward process complicated by the multitude of signal sources. DVD, VHS, computers and video game consoles all store, process and transmit video signals using different methods, and often each will provide more than one signal option. One way of maintaining signal clarity is by separating the components of a video signal so that they do not interfere with each other. A signal separated in this way is called "component video". S-Video, RGB and YPBPR signals comprise two or more separate signals, and thus are all component-video signals. 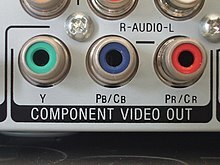 For most consumer-level video applications, the common three-cable system using BNC or RCA connectors analog component video was used. Typical resolutions (in lines) are 480i (DVD) and 576i (US and Japan broadcast analog TV). 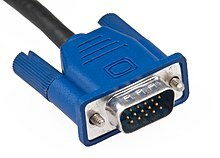 For personal computer displays the 15 pin DIN connector (IBM VGA) provided screen resolutions including 640x480, 800x600, 1024x768, 1152x864, 1280x1024 and much larger. The various RGB (red, green, blue) analog component video standards (e.g., RGBS, RGBHV, RGsB) use no compression and impose no real limit on color depth or resolution, but require large bandwidth to carry the signal and contain a lot of redundant data since each channel typically includes much of the same black-and-white image. At one time computers offered this signal via a VGA port. Many televisions, especially in Europe, utilize RGB via the SCART connector. All arcade games, other than early vector and black-and-white games, use RGB monitors. sync on green, where a composite sync signal is overlaid on the wire used to transport the green signal (SoG, Sync on G, or RGsB). sync on composite (not to be confused with composite sync), where the signal normally used for composite video is used alongside the RGB signal only for the purposes of sync. sync on luma, where the Y signal from S-Video is used alongside the RGB signal only for the purposes of sync. 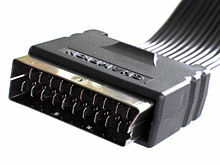 Composite sync is common in the European SCART connection scheme (using pins 17 [ground] and 19 [composite-out] or 20 [composite-in]). RGBS requires four wires – red, green, blue and sync. If separate cables are used, the sync cable is usually colored yellow (as is the standard for composite video) or white. Separate sync is most common with VGA, used worldwide for analog computer monitors. This is sometimes known as RGBHV, as the horizontal and vertical synchronization pulses are sent in separate channels. This mode requires five conductors. If separate cables are used, the sync lines are usually yellow (H) and white (V), yellow (H) and black (V), or gray (H) and black (V). Sync on Green (SoG) is less common, and while some VGA monitors support it, most do not. Sony is a big proponent of SoG, and most of their monitors (and their PlayStation line of video game consoles) use it. Like devices that use composite video or S-video, SoG devices require additional circuitry to remove the sync signal from the green line. A monitor that is not equipped to handle SoG will display an image with an extreme green tint, if any image at all, when given a SoG input. Sync on composite, not to be confused with composite sync, is commonly used on devices that output both composite video and RGB over SCART. The RGB signal is used for color information, while the composite video signal is only used to extract the sync information. This is generally an inferior sync method, as this often causes checkerboards to appear on an image, but the image quality is still much sharper than standalone composite video. Sync on luma is much similar to sync on composite, but uses the Y signal from S-Video instead of a composite video signal. This is sometimes used on SCART, since both composite video and S-Video luma ride along the same pins. This generally does not suffer from the same checkerboard issue as sync on composite, and is generally acceptable on devices that do not feature composite sync, such as the Sony PlayStation and some modded Nintendo 64 models. Further types of component analog video signals do not use separate red, green and blue components but rather a colorless component, termed luma, which provides brightness information (as in black-and-white video). This combines with one or more color-carrying components, termed chroma, that give only color information. Both the S-Video component video output (two separate signals) and the YPBPR component video output (three separate signals) seen on DVD players are examples of this method. Converting video into luma and chroma allows for chroma subsampling, a method used by JPEG and MPEG compression schemes to reduce the storage requirements for images and video (respectively). Many consumer TVs, DVD players, monitors, video projectors and other video devices at one time used YPBPR output or input. Three BNC (professional) or RCA connectors (consumer): Typically colored green (Y), blue (PB) and red (PR). Digital component video makes use of single cables with signal lines/connector pins dedicated to digital signals, transmitting digital color space values allowing higher resolutions such as 480p, 576i, 576p, 720p, 1080i, and 1080p. RGB component video has largely been replaced by modern digital formats, such as DisplayPort or Digital Visual Interface (DVI) digital connections, while home theater systems increasingly favor High-Definition Multimedia Interface (HDMI), which support higher resolutions, higher dynamic range, and can be made to support digital rights management. The demise of analog is largely due to screens moving to large flat digital panels as well as the desire for having a single cable for both audio and video, but also due to a slight loss of clarity when converting from a digital media source to analog and back again for a flat digital display, particularly when used at higher resolutions where analog signals are highly susceptible to noise. Since component video does not undergo the encoding process, the color quality is noticeably better than composite video. ^ This is 720x480 display format. ^ "What Shared Composite/Component Video Connections On TVs Mean For You". lifewire.com. Retrieved 21 March 2018. ^ "Video Signal: Composite vs. Component". Apple Support. 3 October 2008. Retrieved 25 April 2011. Poynton, Charles (November 28, 2006). "Color FAQ- Frequently Asked Questions about Color". Retrieved 2009-06-28. This page was last edited on 28 March 2019, at 03:50 (UTC).